Fishing boats with Chinese national flags are seen at a harbor in Tanmen, Hainan province, (April 5, 2016). The hidden cause of the South China Sea disputes: there aren’t enough fish in the sea. Last week the Permanent Court of Arbitration in The Hague ruled overwhelmingly in favor of the Philippines in its case against China’s South China Sea (SCS) claims. The nearly 500 page ruling undercut Beijing’s claims to control all the land features and water inside China’s nine-dash line and concluded that the disputed land features are either rocks that generate small (12 nautical miles) territorial seas or low-tide elevations that convey no exclusive rights to exploit resources. Although the ruling—and much of the surrounding analysis—has necessarily placed considerable emphasis on sovereignty disputes in the SCS, less attention has been given to the underlying incentives that drive claimant positions and behaviors. Given its power and recent assertiveness in the South China Sea, China’s interests deserve special attention. Aside from enlarging China’s security perimeter, China’s regional interests can be roughly lumped into three “P”s—politics, petroleum, and proteins (fish). The last of these interests, competition over dwindling SCS fisheries, may be most consequential in driving competition, but has not received sufficient analytic attention. Although the SCS covers only 2.5 percent of the Earth’s surface, it is home to some of the world’s richest reef systems and over 3,000 indigenous and migratory fish species, comprising some 12 percent of the total global fish catch. Unfortunately, the region’s fisheries are in serious jeopardy. As of 2008, virtually all SCS fishery stocks are collapsed (roughly 25 percent), over-exploited (roughly 25 percent), or fully-exploited (roughly 50 percent). The situation is only worsening. The most important aspect of the Spratly Island disputes is not oil or sovereignty—it is whether or not SCS fish continue to appear on Asia’s menus. Four trends in particular are important: sustainability, economic importance, rising demand, and declining access. Secondly, fishermen Catch Per Unit Effort (CPUE) has sharply declined over the last several decades as fishermen are forced to spend more time and fuel to bring in the same amount of fish from shrinking fisheries. Destructive practices, including the use of coral-damaging bottom trawlers, muro-ami nets, or even dynamite and cyanide are often employed to squeeze more from dwindling fisheries. Third, critical habitats are disappearing. A 2012 meta-analysis of maritime studies found that in just the last 10-15 years, SCS coral coverage rates in disputed regions have declined from over 60 percent to just 20 percent. Reefs along China’s coastline are in even worse shape, and have declined over 80 percent in the last several decades. The fishing industry continues to be critical to China’s economy. Fishing revenues make up about 3 percent of China’s GDP and generate up to $279 billion (1.732 trillion RMB) annually. Perhaps more importantly, China employs between 7 and 9 million fishermen (over 14 million industry-wide) who operate over 450,000 fishing vessels (nearly 200,000 are ocean-going vessels) comprising the largest fleet on Earth. Many of these workers have little option for alternative employment. Fish is increasingly important to the Chinese diet. China’s fish consumption grew annually at 6 percent between 1990 and 2010, and China consumes 34 percent of the global fish food supply, nearly triple that of Europe and Central Asia combined, and over five times the amount of North America. Furthermore, the World Bank estimates China’s fish consumption will increase 30 percent to over 41 kilograms per capita by 2030, more than double the projected global average. 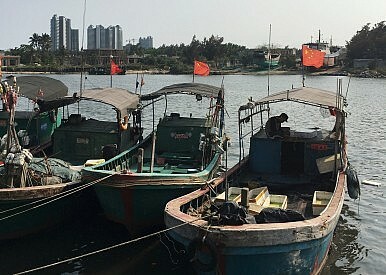 Although aquaculture accounts for the majority of China’s fish production (73.6 percent), growing demand threatens to outstrip supply, necessitating ongoing expansion of maritime fishing operations—the vast majority of which (78 percent) occur in Chinese-claimed waters, including the South China Sea. China perceives its access to disputed fisheries as declining. Three categories of grievances are commonly cited. First, China’s fishing bans and sustainability efforts are commonly ignored by foreigners, leading to complaints that Chinese restrictions allow foreigners free access to fish without Chinese competition. In one 2011 example, Vietnamese fishermen reportedly caught 110,000 tons of SCS tuna compared to China’s 300 tons; a data point that seemingly confirmed fears that regulations undercut China’s potential profits. Second, analysts complain foreign fishermen are “killing the chicken to harvest its eggs” (杀鸡取卵) through overfishing or using destructive practices. Some of this is understandable—while China has made gains in domestic regulation, the millions of “small-boat” fishermen employed by the region’s developing economies pose a serious challenge to governance and sustainability. Third, Chinese fishermen widely complain of foreign harassment. Chinese sources report that between 1989 and 2011 there were over 360 cases of attacks, robberies, detainments, or shootings, with 25 Chinese fishermen killed or missing. Fear of interference has reportedly deterred Chinese fishermen from venturing into some disputed fisheries—although China historically issues around 500 Spratly Island fishing permits, far less fishermen reportedly travel to the region (prior to 2013) due to concerns over interference. Endangered fisheries pose a serious dilemma as claimants seek to promote sustainable governance that would maintain fish stocks over the long term without incurring economic loss or conceding ground on sovereignty disputes. The efforts of different Chinese actors to lay claim to political narratives within conflicting policy objectives (sustainability versus exclusive-access, in this case) produce policy outcomes that are often erratic, contradictory, or even self-defeating. At the regional level, decentralized and often contradictory policies driven by domestic interest groups can undermine potential international solutions to shared problems. The lack of effective international governance is at the heart of SCS sustainability problems. The SCS lacks the multilateral Regional Fisheries Management Organizations (RFMO) that successfully manage fisheries elsewhere. And unlike the East China Sea and Yellow Sea, there are no bilateral or multilateral fishing agreements in the SCS. Furthermore, because the region’s EEZs remain hotly contested, UNCLOS fails to provide adequate governance. China has already dismissed the Permanent Court of Arbitration’s ruling on SCS EEZ disputes as invalid, and absent Beijing’s cooperation, disagreements over regional boundaries will likely persist well into the future. One of two courses of action seems necessary: claimants must either agree to binding, multilateral action to govern contested areas or one country must provide undisputed oversight over fishery stocks. Few regional states possess the power necessary to attempt the latter course of action. China is the exception. China’s numerous efforts at regional governance include ongoing seasonal SCS fishing bans (1999); the administrative upgrade of Sansha city from a county to a prefecture-level city (2012); the complete overhaul of China’s maritime bureaucracies into a new China State Oceanic Administration (2013); Hainan province’s law requiring foreign fishermen to seek State Council approval prior to entering Chinese-claimed SCS waters (2013); and most recently, China’s massive island-building projects in the Spratly Islands (2013-2015). China’s sustainability efforts are undermined by overriding incentives to retain full, if not necessarily exclusive, access to disputed fisheries to provide employment and food security. Since 2007, China has paid out billions in fuel subsidies to compensate for the industry’s unprofitability (as reflected by declining CPUE values). Although subsidies keep the industry afloat—and some 14 million industry workers employed—they have the unfortunate externality of undermining sustainability efforts by skewing market forces to allow fishermen to keep squeezing over-exploited fisheries. Additionally, China’s domestic sovereignty narratives further complicate efforts. Decades of commitment to the nine-dash line as a sovereignty demarcation has produced a great deal of political inertia that can be leveraged by Chinese groups for their own interest. Supporters of the Chinese National Offshore Oil Corporation (CNOOC), for example, argue that government-subsidized oil exploration in disputed SCS regions should be used to demonstrate sovereignty—an argument oft-recycled along the spectrum of would-be SCS actors. Given the importance of fish to the region, unilateral Chinese actions are unlikely to produce a stable and sustainable status quo, especially given increasingly negative reactions to Chinese assertive SCS policies by claimant states and major regional powers. Multilateral governance is needed. Whereas RFMOs typically provide such governance, a new SCS Fishery Management Organization (SCSFMO) may be problematic for several reasons. For one, RFMO’s are founded on UNCLOS provisions, which have become a proxy battleground for sovereignty issues. China’s rejection of the UNCLOS tribunal’s arbitration ruling makes an UNCLOS-based solution harder for Beijing to accept. Moreover, RFMOs that manage fish stocks—as opposed to migratory species—only operate in waters outside of countries’ 200 nautical mile EEZs. Were The Hague’s ruling universally accepted, organizing a SCSFMO would be fairly straightforward; countries would individually manage their own EEZs and jointly manage the remaining international seas. Because some 65 percent of the SCS Large Marine Ecosystem (LME) is disputed however, an effective SCSFMO would need to transcend disputed maritime boundaries to provide effective governance. If dwindling fisheries are significant drivers of regional competition, there may be a silver lining that gives some grounds for optimism. Fish are much more tangible objects of negotiation than sovereignty or historical ownership claims. Claimant states, and China in particular, must work to resolve the tensions between pursuing maritime sustainability and retaining unlimited access. Durable regional solutions must begin with domestic approaches that work to sustainably supply China’s fish food demand and provide employment alternatives to millions of over-subsidized Chinese fishermen. Allowing domestic groups to leverage sovereignty narratives to advance their individual interest impedes constructive regional solutions and works against China’s broader national interests. Sovereignty and sustainability need to be separated in the South China Sea. Claimants might explore multilateral options under UNCLOS Section 197, which mandates that regions “shall” cooperate as required to formulate and elaborate “international rules, standards, and recommended practices and procedures… for the protection and preservation of the marine environment, taking into account characteristic regional features.” Such regional cooperation is urgent and necessary, even when the “characteristic regional features” include intractable sovereignty disputes. Deng Xiaoping’s 1979 proposal to shelve sovereignty disputes and pursue joint development of resources might provide a political basis for Beijing to pursue this approach—especially if it is framed as the necessary condition for continued Chinese access to sustainable fisheries in the SCS that can help meet future demand. Ultimately, the region’s current free-for-all approach to resource management is ineffective at best and disastrous at worst. The latter scenario appears more likely. If, however, claimants can set aside intractable border disputes to negotiate inclusive fishery management, SCS fish will remain on menus for generations to come. Just as importantly, the intensity of sovereignty disputes may ease if claimants can disarm some of the underlying tension stemming from fishery mismanagement. An important part of Asia’s dinner plate—not to mention regional harmony—is at stake. Captain Adam Greer is an officer in the United States Air Force and a Pacific Forum, CSIS WSD-Handa Fellow; some of this research was conducted at the National Defense University’s Center for the Study of Chinese Military Affairs. The views expressed are his own and do not reflect the official policy or position of the United States Air Force, the National Defense University, the Department of Defense, or the U.S. government.